Comments: This brown, small-bodied, short-necked, stocky grebe has a short, stout bill and black eye. During the breeding season, their white bill has a distinctive black ring and the chin and throat are black. In the nonbreeding season, birds do not show the ring around the bill and the chin and throat are white. 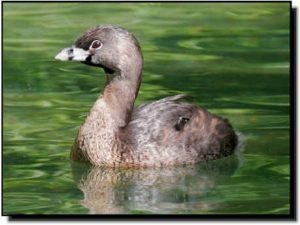 Pied-billed Grebes are relatively common breeders on wetlands throughout the northern and central Great Plains and winter in the southern Great Plains. Their stocky appearance and short bill and neck make them distinguishable from other grebes found in the region.